J. Steven Reznick is now deceased. The online version of this article (doi: 10.1007/s10803-017-3268-0) contains supplementary material, which is available to authorized users. The research reported here was supported by a grant from the Institute of Education Sciences, U.S. Department of Education (Grant # R324A100305) to the University of North Carolina at Chapel Hill. The opinions expressed are those of the authors and do not represent views of the Institute or the U.S. Department of Education. We gratefully acknowledge the invaluable contributions of our project staff and of the families who participated in this study. We miss the creativity, insightfulness, collegiality, and friendship of Dr. J. Steven Reznick, who was such an inspiring collaborator in this research. 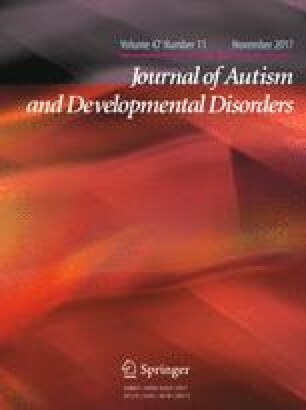 Portions of the research reported in this manuscript have been presented previously at the 2015 International Meeting for Autism Research (Salt Lake City, UT), the 2015 Institute of Education Sciences Principal Investigators Meeting (Washington, DC), and the 2016 Conference on Research Innovations in Early Intervention (San Diego, CA). LRW served as principal investigator for the study, participating in study conceptualization, design and coordination; data acquisition, analysis, and interpretation; and drafting the manuscript. ERC served as co-principal investigator, with contributions to study conceptualization, design and coordination; assessor training, data acquisition and interpretation; and drafting the manuscript. GTB participated in study conceptualization and design; assessor training and data interpretation; and drafting the manuscript. LTB participated in study conceptualization and design; assessor training, coordination, and supervision; data acquisition and interpretation; and drafting the manuscript. JS participated in the design of the study, performed statistical analyses, and contributed to drafting the manuscript. LW participated in interventionist training, coordination, and supervision; served as an interventionist; and participated in data acquisition and interpretation. JK coordinated data acquisition for parent interaction variables and contributed to data interpretation and drafting the manuscript. JSR contributed to the conceptualization and design of the study, recruitment of the sample, and data interpretation. KLM participated in data acquisition and interpretation. SWN contributed to project coordination, data interpretation, and drafting the manuscript. All authors read and approved the final manuscript. Some of the authors of this paper have intellectual property rights related to several of the instruments used in the study. Baranek, Watson, Crais, and Reznick (now deceased) are co-authors of the First Year Inventory. Baranek is the author of the Sensory Experiences Questionnaire and the Sensory Processing Assessment. Reznick is a co-author of the MacArthur-Bates Communicative Development Inventories. The authors declare they have no financial conflicts of interest.